This week is clearly the calm before the storm. The typical numismatic summer always concludes with the annual ANA World’s Fair of Money, with this year’s event occurring in relatively nearby Philadelphia, PA. So, this week is our week of solidifying the events and auctions in our office before we start to prepare for everything to break loose next week as we gather our show supplies and prepare for the marathon of the ANA. Please forgive the brief message and keep in mind that if you have any coins in mind that you’d like us to bring with us, just shoot us an email here and we’d be happy to set it aside for the trip! Why we love it: A rare, early Large Cent that displays plenty of strong, original luster and beautiful, blemish-free surfaces that give the coin true gem level eye appeal. The overall toning and eye appeal is incredible as there are so many bright red highlights shining through the dark brown tones, which in our eyes makes this one of the nicest high-end Large Cents that we’ve handled in quite some time. This Classic Head Cent Issue comes from a moderately low mintage of just 418,000 coins struck in which there are only 2 others graded finer by PCGS with the Brown color designation, neither of which are CAC-approved. Value: The most recent sale of this date and grade was in March in a Stacks Auction where this exact specimen sold for $40,800! The PCGS Price Guide sits at $45,000, but it is available in this week’s auction with reserve set at a fantastic value of just $38,500! That is a very solid $6,500 discount off the PCGS Price Guide value for this lustrous near-gem example of this scarce, early Large Cent even with CAC approval! Why we love it: The 1871-CC is the second-rarest of all the Carson City Issue Double Eagles making it a very highly sought-after rarity. Many issues of this date saw heavy circulation resulting in it being nearly impossible to find this key date in higher grades. An evenly worn and completely original CAC approved XF example could easily pass for a lower grade AU in some eyes. 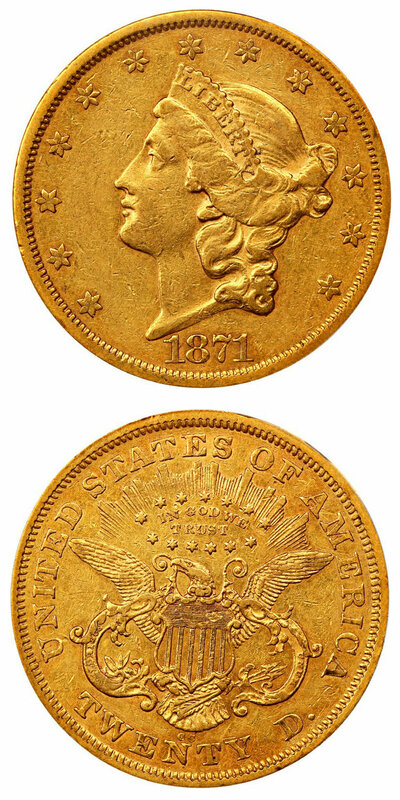 This Liberty Double Eagle Issue comes from a very low mintage of just 17,387 coins struck in which surprisingly even in this lower grade there are still only 33 others graded finer by PCGS. Value: The most recent sale of this date and grade was in June in a Stacks Auction where an example without CAC approval sold for $48,000! The PCGS Price Guide sits at $47,500, but it is available in this week’s auction with reserve set very reasonably at just $42,500! That is a sizable discount off the PCGS Price Guide value of $5,500 for this incredibly rare key date CC-Mint Double Eagle even with CAC approval! Why we love it: A rarely seen prooflike gem example of this scarce New Orleans Mint Issue Liberty Seated Quarter from the famous Pittman Collection. A bold strike with pristine surfaces that display beautiful toning especially on the obverse. The colors include hues of blue-green, rose-gold and a dark lavender. This piece is the highest graded example of the date across both grading services as well as being the only coin designated as prooflike. Value: This Liberty Seated Quarter truly defines a one of a kind piece with all its premiums and very rare, special qualities, making it incomparable to any price guide. An incredible coin is available in this week’s auction with the reserve set at just $7,750, which is a very reasonable price point to add this scarce, nicely toned prooflike gem to a high-end registry set or collection of any kind. 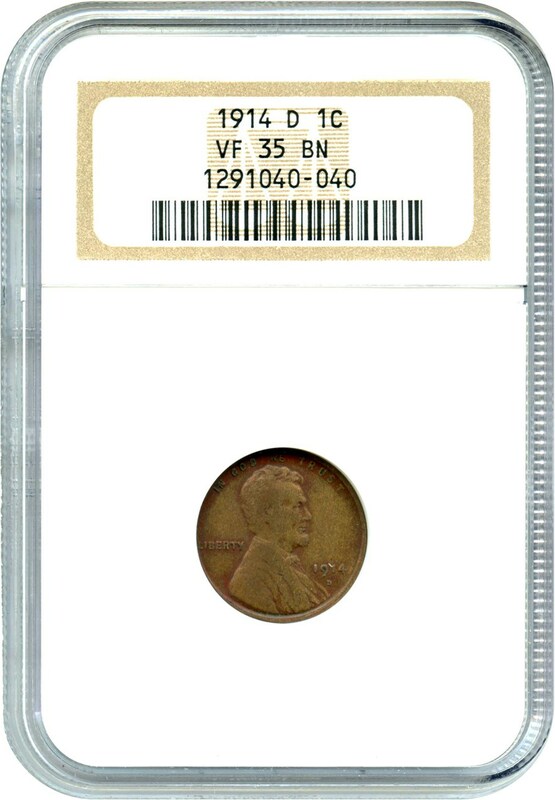 Why we love it: A vibrantly toned gem example of this scarce proof issue 3-Cent Silver. This coin features nearly perfect cameo surfaces that seem almost completely blemish-free. The toning displayed here is absolutely captivating with its electric blue highlights with hues of red and purple. Electrifying colors give the coin such unique, stunning eye appeal. This Three-Cent Silver Issue comes from an extremely low mintage of just 600 coins struck in which there are only 3 others graded finer by PCGS with cameo surfaces. Value: The PCGS Price Guide sits at $5,750, but it is available for purchase at the low price of just $3,750 via Make Offer! That is a generous discount of $2,000 off the PCGS Price Guide value for this beautifully toned cameo gem example of this scarce proof 3-Cent Silver! Why we love it: An ultra-gem example of this scarce proof issue with very strong cameo surfaces. A mostly white coin with a golden hue around the rim and subtly shown on its frosty devices. Truly beautiful, pristine surfaces that make for the ideal eye appeal desired for proof Morgans. This Proof Morgan Dollar Issue comes from an extremely low mintage of just 1,245 coins struck in which there are only 4 others graded finer by PCGS with cameo surfaces. Value: The most recent sale of this date and grade was in January of last year in a Heritage Auction where that example sold for $11,750! The PCGS Price Guide sits at $21,000, but it is available via Make an Offer for just $11,500! That is a very generous discount off the PCGS Price Guide value of almost $10,000 for this stunning ultra-gem cameo proof Morgan! Why we love it: A beautiful gem Saint originally from the famous Wells Fargo Hoard that was found in Las Vegas in the 1990’s. This coin displays incredibly lustrous and pristine, mostly blemish-free surfaces to go along with gorgeous golden coloring that features pretty orange-peel tones. These characteristics make it a realistic potential upgrade. 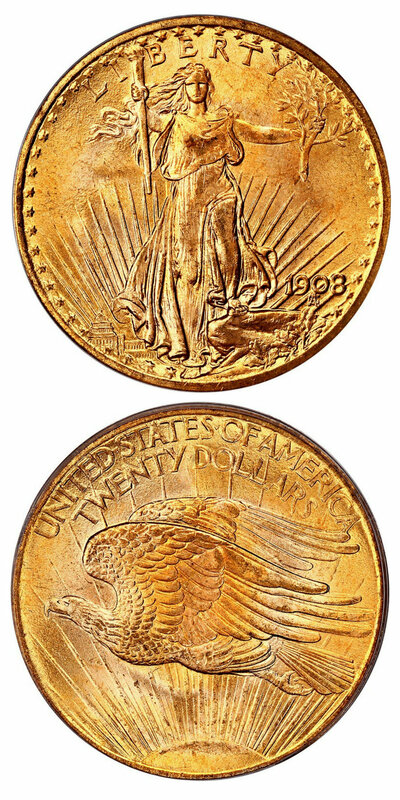 The history and eye appeal of this piece makes it the perfect No Motto type coin for the Saint Gaudens Double Eagle series. Value: The PCGS Price Guide has this coin valued at $5,950 in 67 so this arguably under-graded CAC approved 66 is available to you via Make an Offer for just $3,700! As this coin looks like a true ultra-gem with these pristine, lustrous surfaces and near-perfect eye appeal along with its CAC approval, we find this to be an excellent value. Why we love it: This piece that is tied for the finest example of this date with several others, is the only CAC-stickered example. An ultra high-end superb gem with lovely toning and immaculate surfaces, dripping with luster. 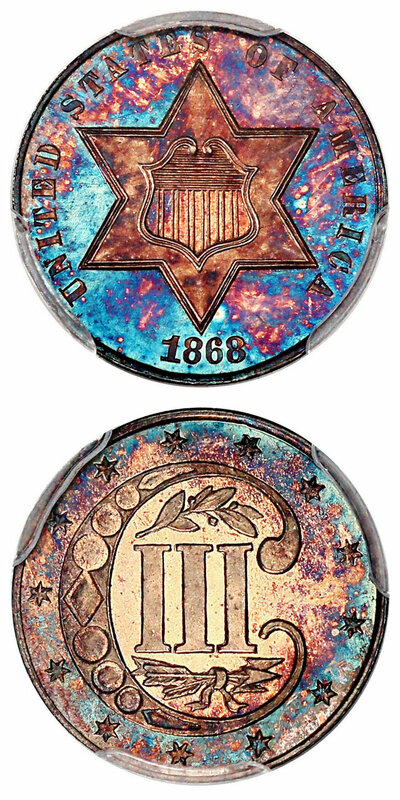 The overall color on this coin is incredibly attractive and unique as it displays a darker gold around the rim and on the inner border of that you can see a subtle rainbow just before the bright frosty white center. Overall, it is simply an amazing example that is perfect for the advanced Registry Set Collector. Value: A recent sale of this date and grade took place last November in a Heritage Auction where this example sold for $12,600! The CPG Value sits at $13,300, but it is available in this week’s auction with reserve set at just $12,250! That is a solid discount of over $1,000 off the CPG Value for this gorgeously toned ultra-gem example of this S-Mint Buffalo Nickel even with CAC approval! 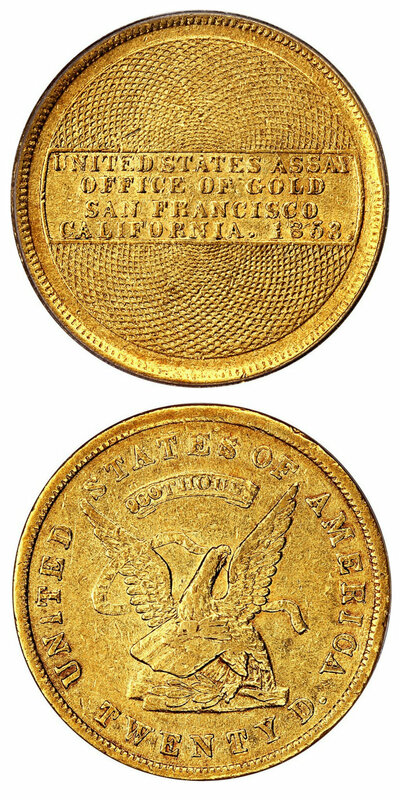 Why we love it: This scarce and highly desirable piece of the California Gold Rush was originally produced by the US Assay Office for use in modern commerce. This CAC approved example is just lightly circulated yet very boldly struck with solid remaining luster and ideal yellow-gold coloring. These characteristics truly give it the look of a higher-grade AU. Value: The PCGS Price Guide sits at $9,250, but it is available for purchase at the reasonable price of just $9,000 via Make Offer! That is a fair discount of $250 off the PCGS Price Guide value for this attractive CAC approved example of this scarce territorial gold piece! Why we love it: An absolutely stunning example of this scarce early issue Walker housed in an Old Green Label Holder. This gorgeous ultra-gem comes without any notable blemishes, blazing luster and very pretty toning. It possesses a golden glow throughout with lovely speckled coloring around the rim on both sides. The perfect eye appeal and immaculate surfaces make for very well-deserved CAC approval. 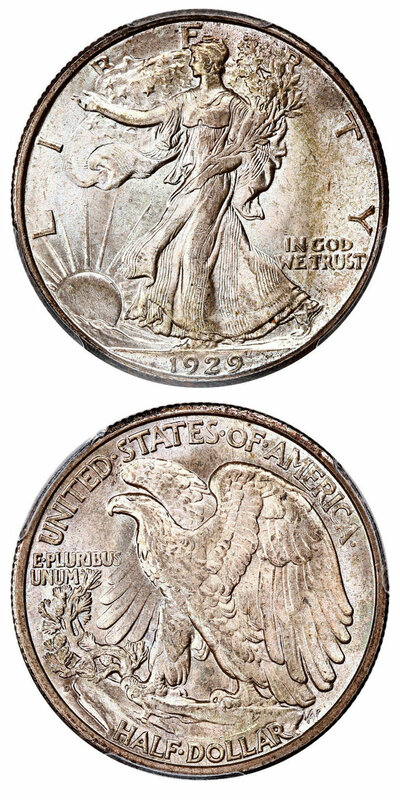 This Walking Liberty Half Dollar Issue comes from a lower mintage for the series of just under a million coins struck in which this example is tied for the finest known graded by PCGS. Value: The CPG Value for this coin is $63,500, but it is available in this week’s auction with reserve set at just $57,470! That is a solid discount of just over $6,000 off the CPG Value for this lightly toned, lustrous ultra-gem example of this scarce, early Walker even with CAC approval! Why we love it: A high-end gem example of this scarce, earlier date Walking Liberty Half Dollar. This Walker displays plenty of luster that combined with its subtle skin of toning and pristine fields and devices makes for premium eye appeal. There are only 6 pieces graded finer by PCGS. Value: The CPG value for this coin is set at $5,000 with the PCGS Price Guide a bit higher at a $4,500. 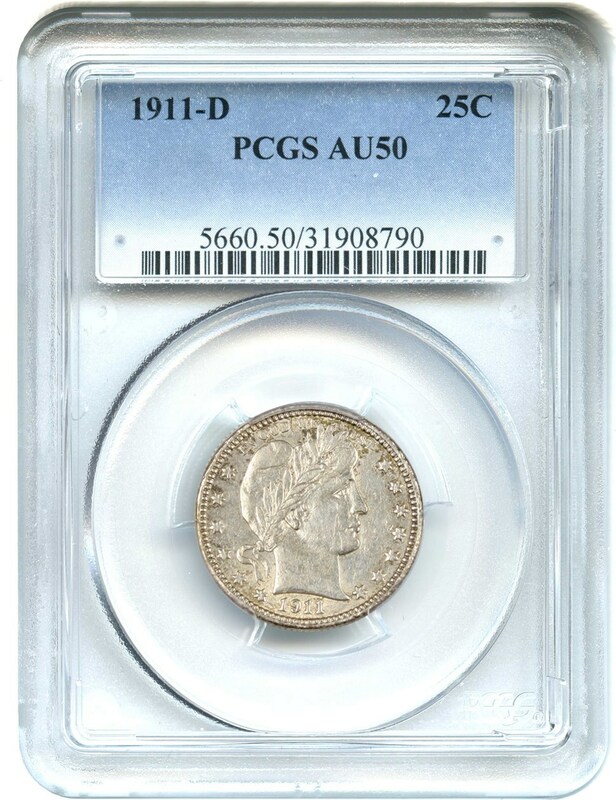 It is available via Make an Offer even lower than the PCGS Price Guide at only $3,750. That is a very reasonable price for this subtly toned, lustrous gem example of this better date Walker! Why we love it: A very popular key date from the Lincoln Cent series that is both scarce and desirable in all grades. This high-end VF example displays light, even wear and ideal, original coloring that gives it XF potential. This Lincoln Cent Issue comes from an original mintage of 1,193,000 making it one of the absolute lowest in the series. Value: The PCGS Price Guide has this coin valued at $475. It is available for purchase at just $375 via Make Offer. That is a solid $100 discount off the PCGS Price Guide value for this very popular key date Lincoln Cent from the Denver Mint! 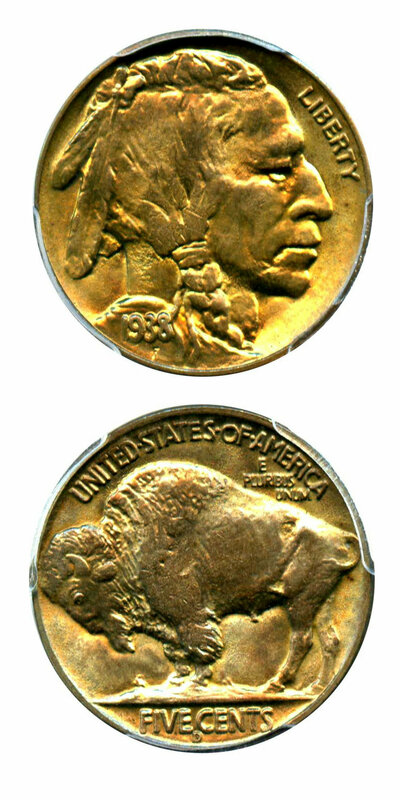 Why we love it: A very uniquely toned gem example of this very popular overdate from the Buffalo Nickel series. The eye appeal is gorgeous and very intriguing as its well-struck and lustrous but also possesses bright yellow-gold toning that incases the coin. This is a nice opportunity to acquire a truly one of a kind item for a very affordable price. Value: The PCGS Price Guide has this coin valued at $240. It is available for purchase at just $195 via Make Offer. That is a fair $45 discount off the PCGS Price Guide value for this very vibrantly toned gem example of this popular overdate Buffalo Nickel! Why we love it: A very underrated, scarce Barber Quarter that is nearly impossible to locate in Mint State making it one of our favorite dates in the series. This is an ideal AU example as it displays some remaining luster, very subtle toning and light, even wear. This tough issue comes from a lower mintage for the series of under a million making it the only D-Mint not to have a 7-figure mintage. Value: Offered via Make Offer for $525, this example has a PCGS Price Guide value of $600 and a CPG Value priced at $682. It’s an excellent price for this affordable yet attractive example of this much better date Denver Mint Issue Barber Quarter! Auction #1026 Lots Posted. Browse & Bid Now! Auction #1025 Lots Posted. Browse & Bid Now!